I had a few minutes and while looking through my pictures I found that I had forgotten about this. It's from a couple months ago. I was out at the local essex hoping to find some back of the truck deal. Anyways, It's pretty cool. I couldn't believe it at first. So yes, like a tool I had to get out for a closer look. 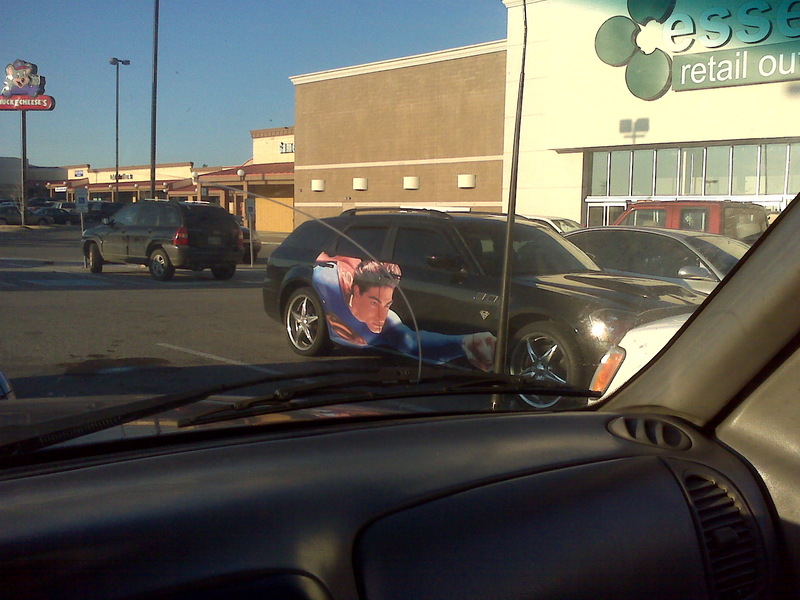 I love it, but I think I would be way to embarrassed to drive around in it. It's just a tad over the top. Like taking a slice of triple chocolate cake and deep frying it, then putting a large scoop of fried ice cream on top, with whip cream and butter. You know, fantastic to behold, but never to be tried. What do you think, would you drive something like this? I mean I love Batmanm, I have pics of me trying to makeout with a wax Batman but I would not drive a car with him all over it. I would drive the Batmobile though. Yeah I need the Batmobile. A superman themed car would be cool if it was subtle, say with a "S" shield replacing all the car brand tags, or a stylish red, blue, yellow colour combination (as long as it wasn't garishly bright). 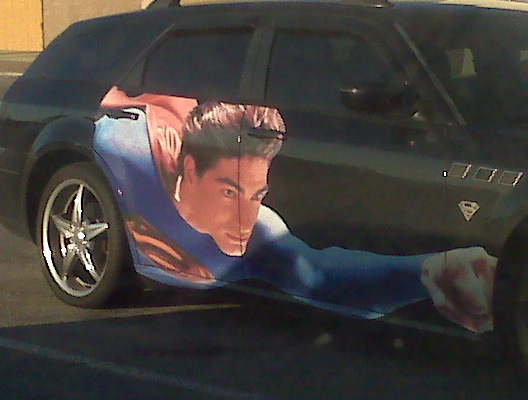 But nobody should have Brandon Routh on the side of their car. Except maybe his girlfriend. Your loss would be my gain. 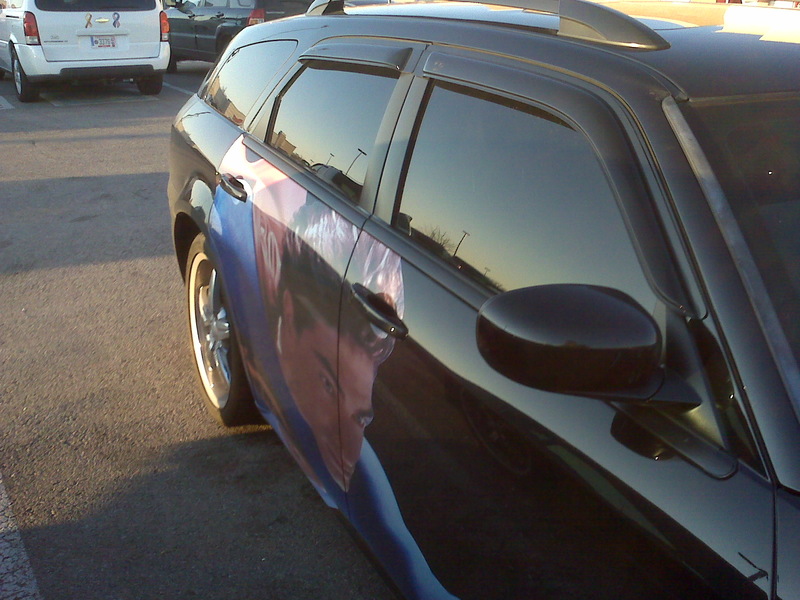 Though to be honest I'd rather have Spider-man 3 on the car. Yes a little over the top....but I do know several nerdly ones in my family who would love it! No, but I would definitely eat the over-the-top recipe you described. It could be worse. It could be the old school Christopher Reeves Superman. No, I wouldn't. Substitute Superman for the Six Million Dollar Man, however....and you may just twist my arm. I had a thing for Lee Majors way back when. I wouldn't want to drive that. Superman may have returned but not my favorite. Now maybe a Dark Knight Joker/Batman combo and I am so sporting that! Are you kidding me with that thing? Ha ha! You have me beat, I once saw a PT Loser covered in flowers. This is way lamer! I would rather batman or quail man. I don't think it would be long before I drove it off a cliff hoping it would fly. This is why I'm not allowed to wear a belt or have shoelaces. I can't be trusted. I would do it for money. But I don't think it would look very good on my Yugo. AsBlack, LOL, that joke is so obvious, how could I have missed it? Awesomeness. What are you trying to say 'bout my Twilight tat? Huh? Haha The Brandon Routh mobile! Talk about the ultimate fail.